This post is added to from time to time. I’ve attempted to keep this topic in one place. I really don’t hate Macs or OSX. I have owned, programmed, recommended and given Macs as gifts. I just hate how the Mac Culture has evolved. In the end, computers are just tools. They won’t make you smarter, better looking or cool. If you need a computer manufacturer to give you your self-worth, you have my pity. There is no middle ground with Apple – you only get what Steve thinks you should have. They have expensive and some low end junk to compete. Apple monitors are way expensive. MBPs are through the roof as well – $4500 for a 17”. You can spend that much on a PC lappy, but with Apple you don’t have any choices. Apple once had an old PPC Mac that was cheaper than a similar Dell – this was the first and only time this ever happened. Macs are way more expensive. Why isn’t there an uproar in the Mac community? Bill Gates is viewed as an evil dictator because he wants to control the PC desktop. Perhaps he needs to take some lessons from Apple. Does Apple drug their users so they won’t complain? The Macintosh is the most restricted and locked down computer system on the earth. The problem with Macs (or perhaps the users) is when you have problems – there is no way to diagnose or fix them. Take it to the Apple store and have a genius look at it. Mac users are fairly computer illiterate. They love the whole Mac culture because you aren’t allowed to DIY, there is no reason to learn anything. Macs are for fun stuff, PCs are for boring office stuff. Riiiiight, where are the Mac games? PC hardware is infinitely customizable and upgradeable. Macs on the other hand, are said to “age more slowly.” This really means that you have to wait for Steve to give you more, but only when he feels you need it. The UI on PCs is infinitely customizable. With Macs you are once again stuck with what Steve thinks you need. Office 2007 has a great new UI feature called the ribbon bar. It exposes many of the lesser known features and makes them much more easily accessed. The ribbon bar will never appear on OSX because it violates their UI guidelines. CPUs – for years we heard that Macs with their 68000s and PPC chips were faster and better than anything Intel ever made. When the first Intel MBPs were released, all of the Mac fanboys went nuts over how much faster it was (2x rings a bell). I read one legitimate benchmark of a high end PPC Mac vs a high end Intel PC where they both ran Linux. They came out very even. Vista had more users after just 4 months that OSX does in total. Vista sells 100 million copies in the first year and it’s the Disappointment of the Year! I bet that more Mac users also run Windows on their Macs than there are people who have switched from PC to Mac. Why is no one running OSX on beige boxes? Windows on the Mac – the perfect accessory. The Mac has finally become an acceptable platform thanks to Windows. Which one of these looks safer to you? Installation defaults will transcode your existing music library to AAC, delete your MP3s, rename and move them to to a new folder. This renders your music library pretty unusable by anything other than iTunes/iPod. Apple’s longstanding position has always been that they’d have DRM even if the record companies didn’t want it. DRM is their way of chaining people to the iPod, iTunes, and iTunes Store. Vista is the only OS that can play premium content (DRM’d HD movies) – what’s up Steve? Apple is on the Blu-Ray advisory board, but they still don’t have anything that can actually play this content. Vista is continually knocked because it uses more memory and CPU/GPU than XP. You never hear this complaint about OSX even though I hear many claim to need more than 4GB to work effectively on OSX. The latest OSX releases won’t run on older PPC hardware. The first Intel Macs were claimed to be 2-4 times faster than the PPC based machines they replaced. The Fanboys are just so annoying. Apple always charges for what amounts to Service Pack releases. The smart people who want to try something different (from Windows) always seem to try Linux. That leaves Apple with dumb bunnies who think they will be cool if they switch. More thought is needed in the area of the Apple cult. I know it’s a corporate core value, but not much is written about it. I first started reading about this phenomenon in the book Organizing Genius by Warren Bennis. The Mac Community is a huge phenomenon. A bunch of folks telling each other how cool and smart they are for using a Mac. Limit choices and force conformity – there you have it! You can’t have problems if we don’t allow you to try other things. This makes perfect sense to me. He claimed that this is an advantage that the Macs have. I guess he didn’t realize that any OS can limit their choices like this – ooops. Using OSX is like having a bad food allergy. You have to avoid anything non-Apple or you get sick. Microsoft posted profits of $4.3B on revenues of $13.7B, an increase of 23 percent over last year. Apple reports that they sold a lot of iPhones. Leopard’s Finder has a glaring bug in its directory-moving code, leading to horrendous data loss if a destination volume disappears while a move operation is in action. I first came across it when Samba crashed while I was moving a directory from my desktop over to a Samba mount on my FreeBSD server. The idea that everything just works is pretty funny. Everything Apple gives just works. It’s a closed system – hardware, OS, applications and the store. 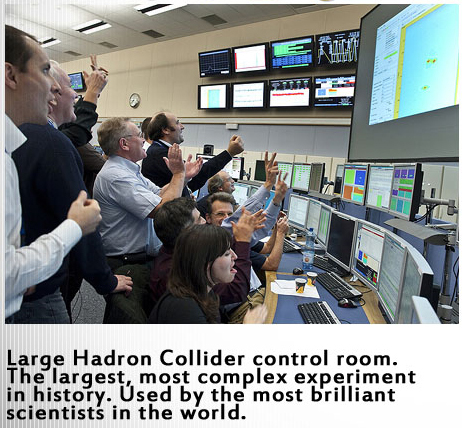 Wouldn’t you expect that such a tightly controlled environment to work? You can’t change the interface on OSX. With Windows you can make it look and work like anything you want, including OSX. Coverflow is the best thing since sliced bread. It’s a blatant ripoff of Vista’s Flip 3D look and feel, which invariably is described as fluff and useless. A Dual 1ghz Mac Pro can’t run the new Leopard (this from fanbois), yet Vista is expected to run on everything. Microsoft really screwed up the marketing of Vista. I won’t show a fanboy friend of mine my new Sony book reader. It would kill him to realize that there are other manufacturers of cool gear out there besides Apple. Something is starting to stink, and I’m not the only one noticing. The Macosphere is filling up with crap. With 14 year olds blogging their Mac setups. With entire websites devoted to covering pretty Mac apps. This apple is rotting at its core. It is infected with smugness, and more and more, the symptoms are starting to show, whether it’s the eye roll at the non-iPod music player, or the snide comments about my laptop’s lack of curves. Everyone knows that when something starts to rot, the rot must be amputated to protect what is left. As an underground hacker for many years, I am in the perfect position to perform this operation. It is a pleasure to accept this opportunity on behalf of the Mac user’s community. Tomorrow, one maggot will be taken down. This particular larvae is malignant, obnoxious, and has a fetish for posting about his constantly changing Mac setups. Let me repeat that. A fetish. For Mac setups. This is for his own good. The target will be posted on this site once the attack begins. I will be sending said target a note with a heads up before. Hopefully, by the end of the attack, a sea change will begin to happen. 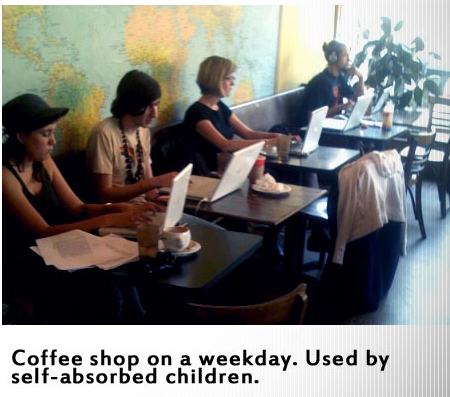 Does anyone disagree with me that the Mac world be a much more pleasant place if smugness wasn’t tolerated? The attacks will be untraceable, and unstoppable. I guess there are idiots everywhere, but why does it seem that they all have iPhones? My pastor who recently got a new Mac told me about his impression of Steve’s introduction of the iPhone. He said it was riveting, like being in church. Steve was preaching to the choir. This is all a part of the plan I explained to him. I find it infinitely amusing that the latest incarnation of the Zune has much of the same capabilities as, is cheaper than, more portable than, and has a hard disk that’s twice as big as the AppleTV. Microsoft is reporting record profits for the last quarter while Apple is scaling back on their iPhone production. Why does it seem like Macs are less prolific than the fanboys are constantly telling us they are? Is this just the optimistic Linux effect? You know where you keep telling yourself it’s ready for the desktop and this will be the year. There is a popular image circulating the web of a college lecture hall with almost every student sporting a Mac. Great huh? They forgot to mention that the college gives one to each student (no choice). The so called pundits have all mostly weighed in on the Mac side. You would think that the whole world has gone Apple and that Microsoft is on the verge of bankruptcy. I have been struck by *every* browser statistics page I see. I know page counts are not reliable, but certainly the general trends they portray are useful. Take for example page hit percentage by OS. Please find me a page where OSX is higher than 5%. The Safari browser is running around 2%. Does this mean that Firefox has dominated the Mac browser market? Everywhere I look I see the same numbers: 4-5% of the page hits are Mac OSX. Most even have Win2K beating OSX. I can now sleep at night knowing that Apple’s impending dominating is simply wishful thinking. Check it out HERE. How many people have you heard say – “My iPhone changed my life”? People call it the Jesus phone. This just makes me sick. What kind of a sad life must you have to experience such renewal from a cellphone? None of the feeble features of the iPhone are new or revolutionary. Only the interface is different. Are the iPhone fanboys that dumb to have never seen a smartphone before? How does the interface have such a life changing effect? I understand how much fun new gadgets can be, but I’d never belittle my life by saying that a gadget has changed it! My soul isn’t that cheap. I was listening to my favorite fanboy Leo LaPork on Paul Thurrotte′s Windows Weekly podcast. Leo was opining about how people complain so much about Vista. He said he couldn′t understand why. I haven′t laughed so hard in a while. That is like Hitler asking, “Why do people dislike the Jews so much?” Leo is becoming a Vista proponent – I like him better when he showed his true colors. The main lesson is that you can’t trust pundits like him. This is how Microsoft should be advertising! You heard it here first – I’m predicting a backlash against Apple. There will always be a few true believers, but in general Apple will fall out of favor and no longer be viewed as cool. Walle functioned autonomously for over 800 years. Eve was locked down remotely and had no user replaceable parts. Microsoft’s been touting its “fastest annual revenue growth since 1999,” which resulted in a princely $60.42 billion dollars in its last fiscal year, but the number that has us rapt? Vista licenses sold since launch about 18 months ago: 180m. On the other hand Apple reports selling* 1 million v2 iPhones since the launch. This sounds pretty impressive until you look at the rest of this market. Nokia sells on average 1.3 million phones every day. An interesting article by an iPhone developer about the iPhone and the future of Mac OSX. 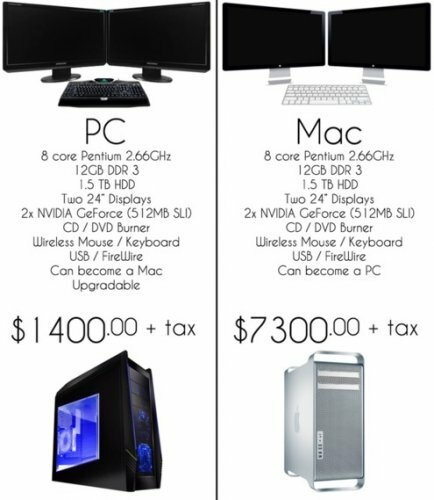 Macs and PC cost the same right? Trust Steve, it’s for your own good….. 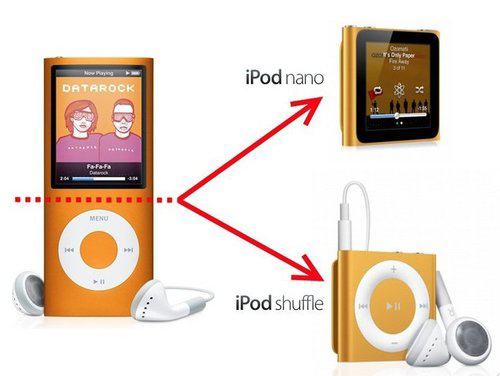 I finally figured this out – the iPod Touch is just a PDA. I know I’m a bit slow on the uptake. This demonstrates the power of Apple’s advertising. All of these features were available on my PDA almost 5 years ago (including the last four). You can argue that the interface or applications are superior, but it’s still just a PDA. The PDA market has really gone down the toilet the last few years. I guess nobody told Apple or their lemmings. Taking this a step further, the iPhone is just a PDA (iPod Touch) with a phone builtin – just like every smartphone produced for the past half decade or so. Steve is a genius. He takes an old, declining technology (PDAs) and tells people it’s new. He has created a cult that will buy anything he offers. They actually think he invented this stuff. I just got back from vacation and have been catching up on my Podcasts. Leo (my fav fanboy) was so excited about how well Apple has been doing (this sounds like a broken record I know). He threw around numbers like 20% sales and 10% penetration. Unfortunately this is simply optimistic thinking. Apple has been doing better, but no where near the fairytale levels that these blowhards breathlessly proclaim. How do you measure penetration? Perhaps the most unbiased approach is from the web. The W3 School does a very good job of collecting statistics like this. Perhaps this will be the year where they break 5%! With today’s iPad announcement, we can see how accurate he was. First we got a cute little Fisher-Price smart phone for the truly cool and hip. 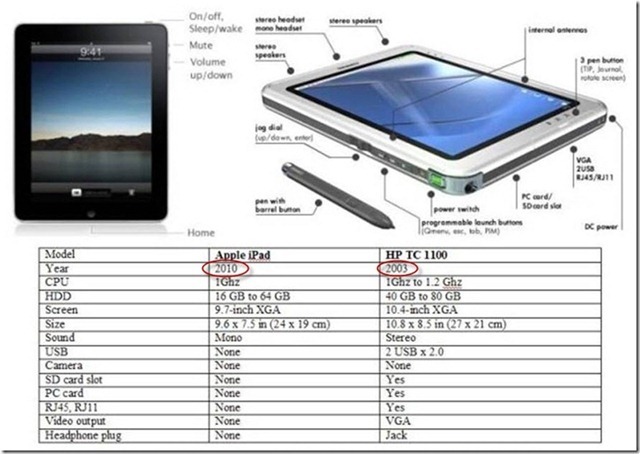 Now we have the iPad; a bigger, fatter version of the same. Behold the future! Crappy computers for the pre-school set. Social News sites like DIGG can be truly awful, but they have let you decide what content you want to read for a while now. I simply exclude politics and Apple. This doesn’t prevent the spillover into anything that threatens the faithful, but it makes it more bearable. Engadget is another story. I like the edited content, but they are all fanboys to some extent and any story about Apple can dominate the their site for days. If it’s from Stevo himself (like the recent iPad announcement), they will dedicate weeks of coverage after the minute by minute live coverage has long killed off anyone who doesn’t like that flavor of Koolaid. Things are looking up though. My son recently showed me that you can browse to http://www.engadget.com/exclude/apple and voila! No more Apple stories. He readily admits this purchase price disparity, but blows it off by saying that Macs hold their value better (lower TCO). As I thought about this I realized that I’ve Never sold any of my used PCs. I just give them away. I won’t say that they are worthless, but their value to me is such that they can be given as a gift without regret. Now I started thinking why is this different for Apple computers? Why are they worth more? Why do PCs depreciate so quickly? The answer is that Apple’s hardware refresh cycle is measured in years while the PC’s is measured in weeks if not days. Think of it like this: I build a PC for $1000 and a year later those same parts only cost $500. If I try to sell the year old PC I might get $250 for it. The $2000 Mac, one year later still costs $2000 to purchase new. If I sell this year old Mac I could probably still get $1500 for it. This sounds like a pre-owned BMW commercial. You must keep in mind how much the PPC Macs were worth after the Intel based models were released – not much. The ability to incorporate the newest technology whenever you want places a powerful downward pressure on price. This does not apply to the Apple controlled ecosystem. I’ve bought CPU chips that went down in price by hundreds of dollars by simply waiting a month. I’ve often heard this argument restated as, “Apple computers age more slowly.” The TCO arguments are Hoooey! My PC upgrade options after the first year are to either upgrade to a current (faster) PC (let’s say it costs $1000) or purchase two more of last year’s (slower) PCs (for $500 each) and in both situations I still have the original PC. I have now spent $2000 for my PCs (same as for the Mac). The Apple has no upgrade choices and it’s still stuck with a single year old machine (can’t really call it slower because there is nothing faster). Update – You may have thought my example numbers were a bit out of whack. 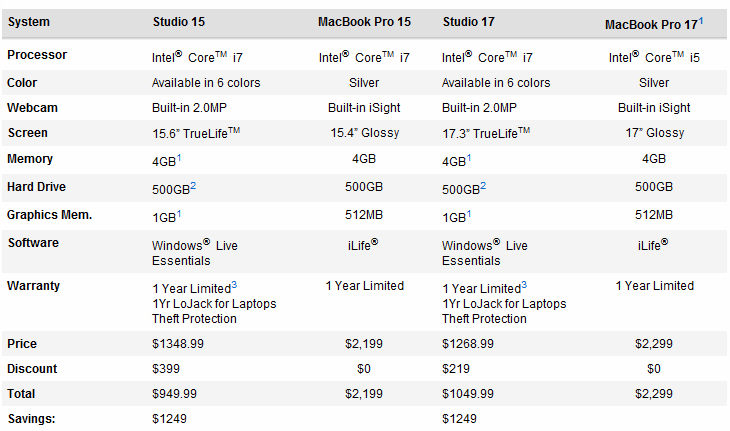 Not so – I’m including a comparison chart of two MacBooks and two comparable Dells laptops. My wild guesses were nearly spot on! The answer, of course, is the Murse or Man Purse. I’m dead serious. All of the leather goods companies are going nuts building up their inventories. My second issue with the iPad is far more subtle: the slightly convex back. If you place it on a flat surface like a desk or table it will spin freely like a top. You always have to use two hands to operate it. 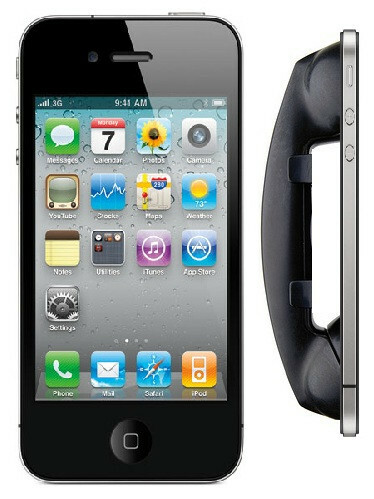 Forget about one handed swiping or even typing when it’s laying on a flat surface. Of course this could be corrected by changing the shape of the back or adding some rubber feet, but then it wouldn’t be nearly as cool. Can something be too cool to be useful? This device is designed to be displayed on a coffee table and used while you are watching TV. Portable, it’s not! If it was more of a computer than a media consumption device I think the portability issue would be less serious. We already carry around laptops. I just can’t see people carrying these around on the off chance they may want to listen to or watch something and still have to carry a laptop to get work done. Perhaps this reflects how Apple views it’s customers: they don’t really need a computer because they are too dumb. 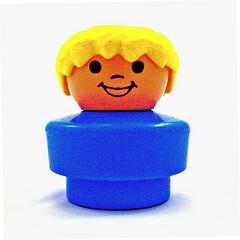 iPad – the perfect device for the Fisher Price computer user. iPad users only ever need to listen to music, read email, play games, look at pictures, and browse the web. Do you seriously think any of them read books? Anyways it’s hardly groundbreaking. Apple takes old worn out technology, dresses it up and all of the faithful gush over it. The Onion just does it right…. Look at all that I’ve done for you people — and now you quibble about some trifle? It’s a work of genius! With every other phone OS you can pick from a variety of manufacturers and models. If one doesn’t work or suit your fancy, there are many others to take it’s place. Don’t worry – Steve gives you only what you need…..
Have you heard about the latest App Store Developer news? When you sign up with Apple’s App Store as a developer you are basically required to sell your soul. Recent news reports reveal that Apple has begun patenting interfaces, features and ideas that developers have come up with! The thought being that everything in the App Store belongs to Apple (you did read the fine print right?). I can imagine a developer releasing a v2 of his app and getting slapped with a lawsuit because Apple has patented features he is using from his v1 app. I’m sure there is a good reason for this. Steve is like a messiah, a benevolent dictator. He would only do things that are good for us right? Psssst – hey iPhone developers, have you heard about Android and Phone7? First – you switched because of iMovie? I could understand FCP, but not that POC. Second – Aperture, OK this is a decent piece of software, but you seriously never heard of Light Room? Which brings me to the Third point – Adobe Creative Suite has wonderful, professional versions of each of these types of programs. You stated that you wanted to run the red-headed stepchild versions on the Mac. Are you afraid of the control key? Does the command key make you feel more powerful? I often mock Mac OS as being designed for retards. In my core I do know that it’s just a tool. I really don’t care what tools you choose. It doesn’t effect me, but your reasoning on this issue is truly retarded. Best Windows Phone Commercial ever! Everything in the commercial is 100% true including the fact that only two people in the room have Windows Phones. Zack Arias (big name Photog) – Loves his Macs and experienced only frustration trying to work with PCs, but this reason is the best of all! At least he’s honest. This entry was posted on 28 November 2007 at 7:24 pm	and is filed under Technology. You can follow any responses to this entry through the RSS 2.0 feed. You can leave a response, or trackback from your own site.